Namaste, Impeccable Warriors of Light! 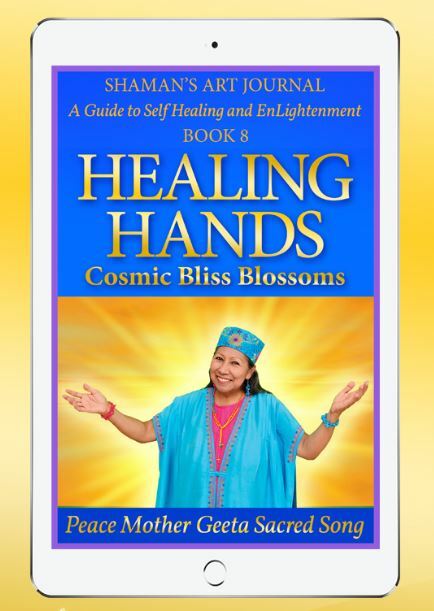 In Healing Hands: Cosmic Bliss Blossoms, Peace Mother introduces you to the healing creative power present in your hands. She shares how to build a triumphant spiritual foundation that will support your healing abilities and every aspect of your Soul Journey. The Divine Knowledge revealed will help you steadily flow the Grace and Love of the Universe through your hand chakras, the sacred energy centers in your hands. Healing Hands: Cosmic Bliss Blossoms provides you the necessary spiritual guidance to recognize and dissolve shamanic amnesia of your spiritual essence, shamanic healing gifts and Divine Purpose. Rich with shamanic training, the book covers how to use sacred sound, holy Mantras, sacred hand postures, and other potent practices that amplify the luminous strength and balance of your mind, body and soul. Through the Holy Mother’s empowering Wisdom Teachings and easy-to-do techniques, you can spark your inner bliss by connecting with the Cosmic Fountain of Healing Power that will stream blessings through your hands to others. Learn the mystical power that exists in each finger and the palms of your hands, that can unite you in Oneness with the Creative Force of the Universe. As well, discover how to heal conditions, enhance inner serenity and clear your hands of energy overloads or blockages. Furthermore, the book’s shamanic Light Activation Artwork, channeled through Peace Mother by Great Spirit, is a potent tool that can be used to facilitate meditation and contemplation; by saturating yourself in its nourishing vibration, the chakras in your hands are activated, energizing and fortifying the flow of healing energy within you. As Peace Mother writes in this illuminating book, NOW is the moment to align with your Higher Self by unlocking the power of your healing hands and accessing the Bliss of the Universe. If you desire to accelerate the blossoming of your soul and become a better instrument for the energies of Love and Light to flow through you, dive into Healing Hands: Cosmic Bliss Blossoms today! Your destined Soul-Awakening and greatest creativity is waiting for you! The Shaman’s Art Journal series focuses on thirty paintings channeled through Peace Mother by Spirit, as well as the Spiritual training that took place during the creation process. The stories connected with each art image describe Peace Mother’s mystical journey from yogini and shamanic apprentice to Illumined Master. Each image is alive with Sacred Healing Power that accelerates the viewer on their Spiritual Path. Included in each e-book is the artwork and a Divine Message, which shares the story of the Soul Evolution that took place before, during and after the paintings were completed and the Wisdom Teachings related to the Message theme. Meditations, contemplation exercises, Sacred Mantras, transformational affirmations and Shamanic training are also provided.